As I slowly move away from full coverage foundations, I tend to use my old favorites less and less. I am gearing up for another yearly makeup purge, and while going through my foundation drawer I realized that even though I featured NARS Natural Radiant Longwear Foundation ($49) on my insta-stories pretty often, I never gave it a proper review on the blog. I guess, now is as good a time as any! According to NARS, this long-lasting, medium to full coverage foundation offers 16 hours of comfortable wear time and feels lightweight on the skin. 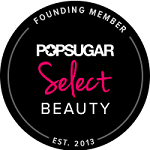 As an added bonus, the oil-free, and fragrance-free formula is infused with Apple, Watermelon, and Raspberry extracts to provide subtle skin benefits over time. From my experience, NARS Natural Radiant Longwear Foundation is indeed long-lasting, and it looked really nice on my skin AM to PM. However, I needed to do one minor touch up every 5-6 hours of wear – for some reason, it gathered in my nasolabial folds, while the rest of the face still looked fresh and flawless. Maybe that’s just my weird bone structure, but I thought it was worth mentioning. The coverage is described as medium to full, but I feel like it leans more full. 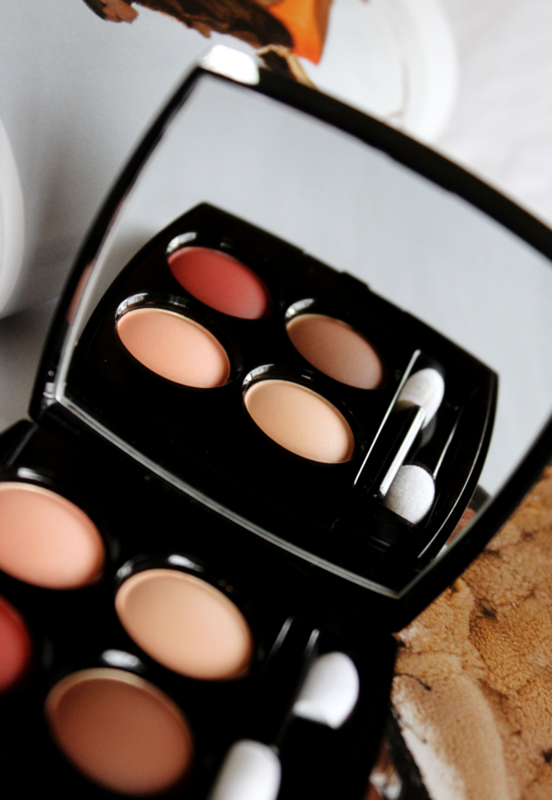 To get a true medium you’d have to use very little product, and it would be like using a pigmented eyeshadow to get a sheer finish – it takes more effort than it’s worth to make the end result look good. 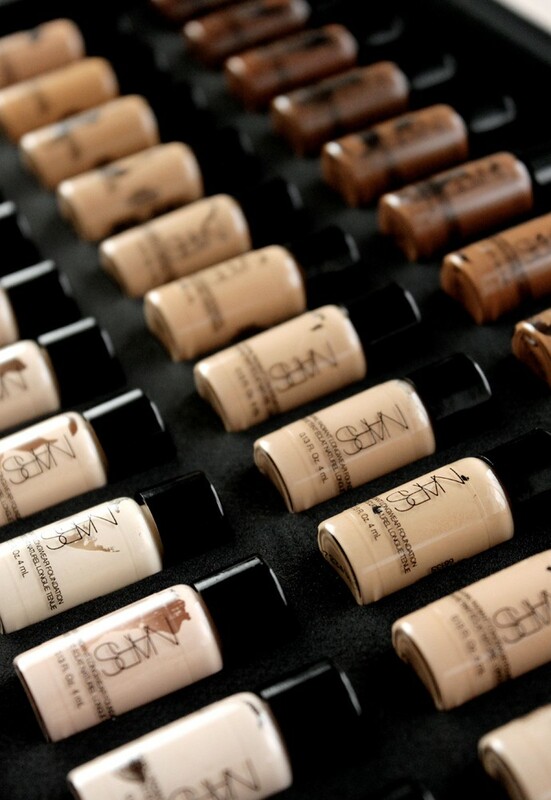 NARS Natural Radiant Longwear Foundation currently comes in 34 shades. 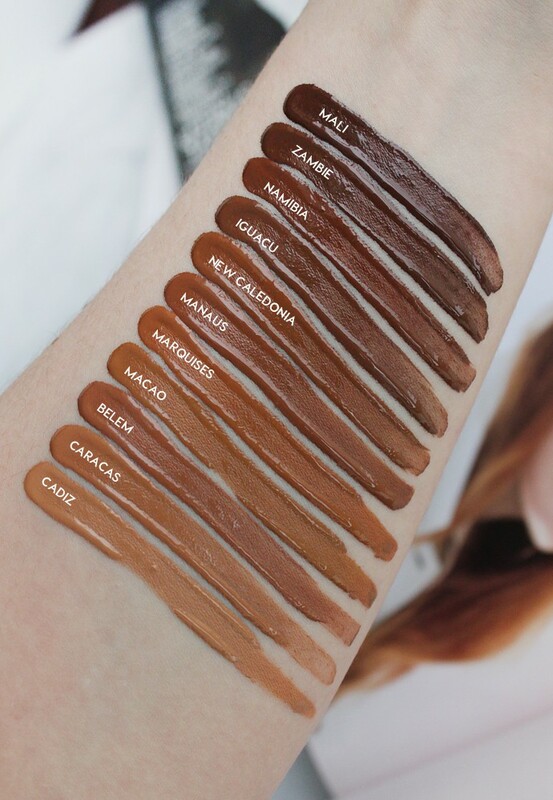 There may be some gaps, but I thought the current colors all look convincingly skin-like and will fit a very wide range of complexions and undertones. I actually want to share one of my pet peeves, and I would love to hear if you ever felt the same way. 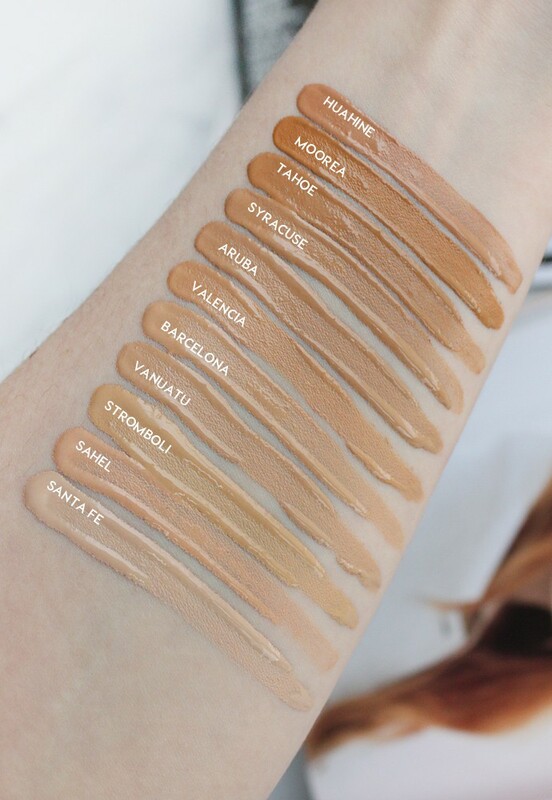 Did you notice how sometimes brands [mainly drugstore] with a very extensive range of foundation shades seemingly only have those just for appearances’ sake? Like someone randomly poked around at the color wheel to pick a few colors here and there to create an illusion of inclusivity. 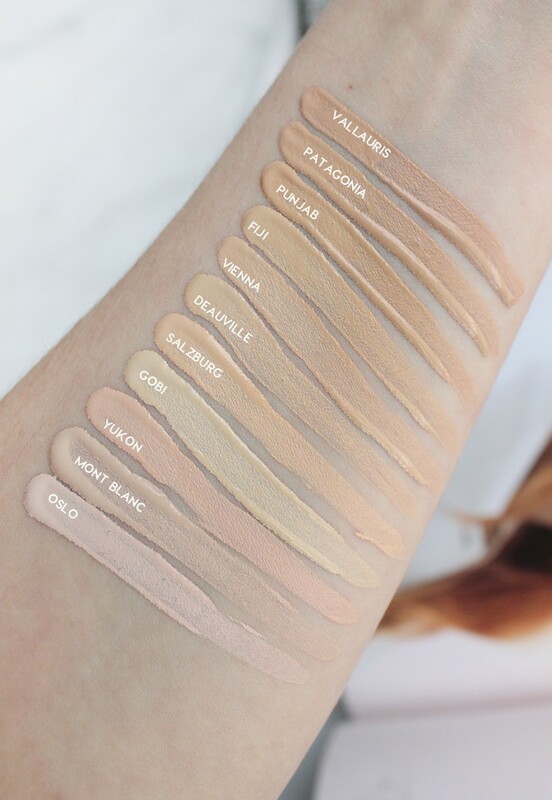 I look at those shades and think to myself “there’s no way they created some of these based on real people with real skin”. 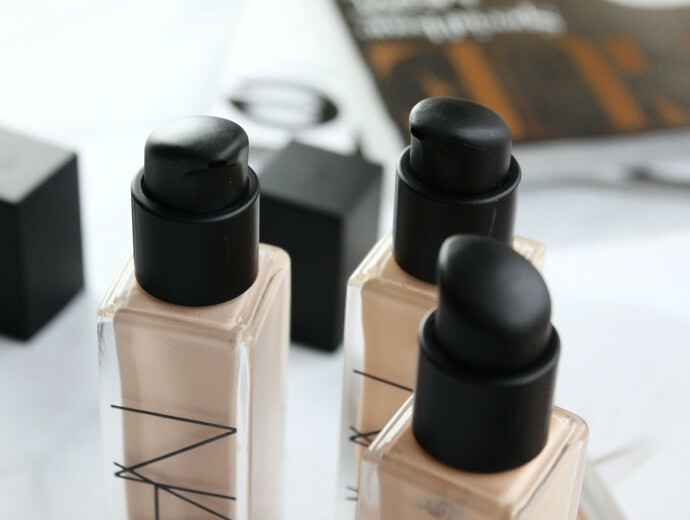 That’s the thing with NARS, their foundation shades look perfectly skin-like and that’s why so many people swear by this brand. I’ve seen some polarizing reviews: some people love this foundation and others absolutely hate it. From what I could gather, it looks like for some reason this formula doesn’t work well for dry, flakey skin or for very oily skin. 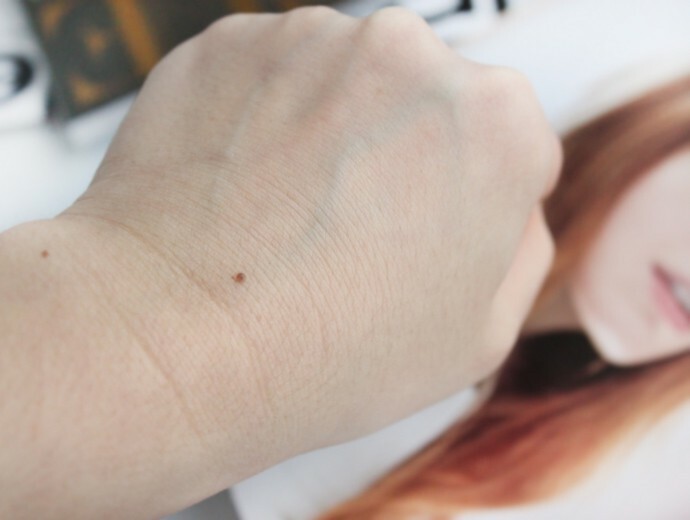 Allegedly, it emphasizes the dry areas and doesn’t look good; but it can also completely break down and look super patchy if your skin is oily. I personally didn’t experience any of that with my combination skin. 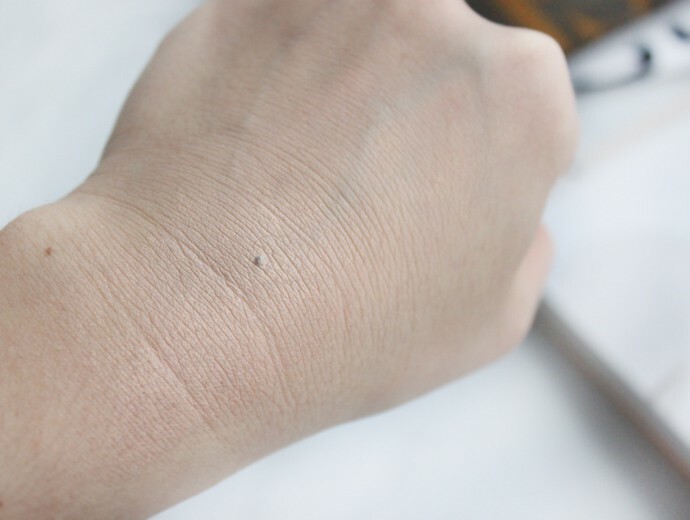 And here are arm swatches of all 33 shades that NARS Natural Radiant Longwear Foundation currently comes in. Please refer to the text overlays for shade names, it would be too long to list them all in the caption. You like medium to full coverage foundations. 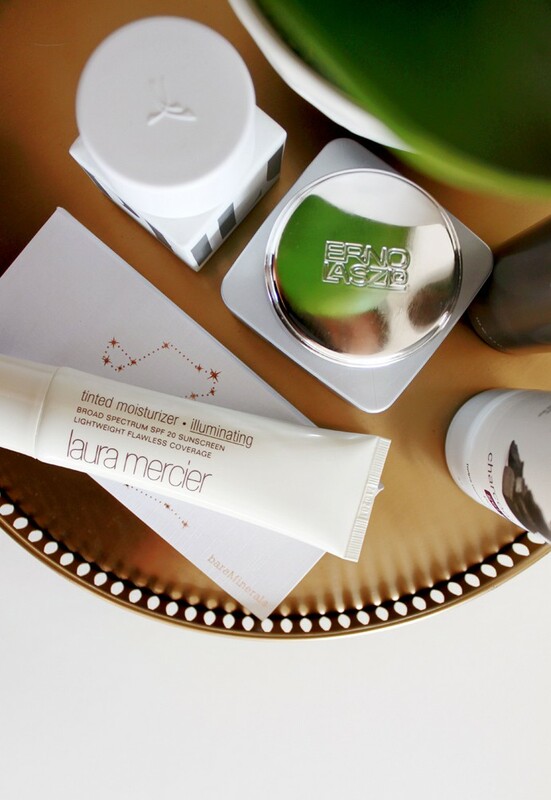 You are looking for a luminous, slightly dewy finish. You have normal, or combination skin. You have very oily or very dry skin. You prefer a true matte finish. 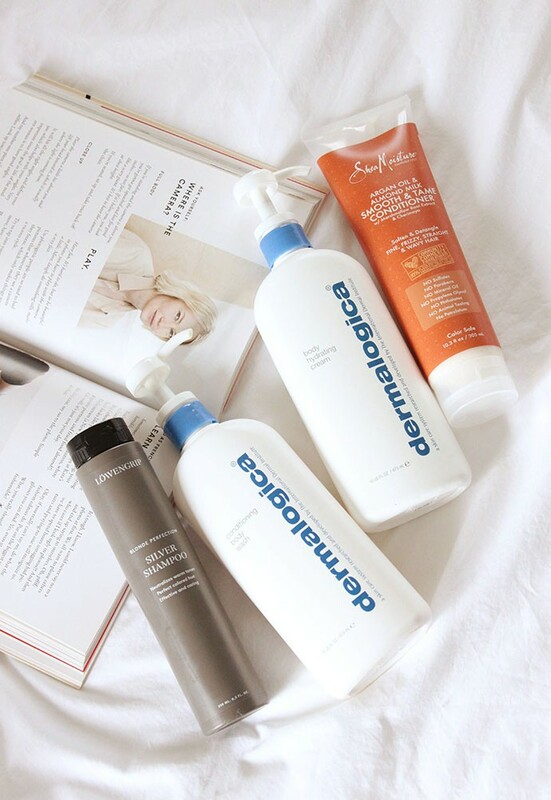 Ingredients: Dimethicone, Water/Aqua/Eau, Phenyl Trimethicone, Glycerin, Polymethylsilsesquioxane, PEG-10 Dimethicone, Dimethicone Crosspolymer, Cyclopentasiloxane, Trimethylsiloxysilicate, PPG-3 Benzyl Ether Myristate, Boron Nitride, Bis-Butyldimethicone Polyglyceryl-3, Butylene Glycol, Sorbitan Sesquiisostearate, Rubus Idaeus (Raspberry) Fruit Extract, Citrullus Lanatus (Watermelon) Fruit Extract, Pyrus Malus (Apple) Fruit Extract, Lens Esculenta (Lentil) Fruit Extract, Tocopherol, Sodium Pca, Sodium Lactate, Disodium Stearoyl Glutamate, Hydrogenated Polydecene, Pentaerythrityl Tetraethylhexanoate, PEG/PPG-14/7 Dimethyl Ether, Pentaerythrityl Tetra-Di-T-Butyl Hydroxyhydrocinnamate, Sodium Stearoyl Glutamate, Behenic Acid, Stearic Acid, Stearyl Alcohol, Behenyl Alcohol, Disteardimonium Hectorite, Triethoxycaprylylsilane, Barium Sulfate, Aluminum Dimyristate, Alumina, Tin Oxide, Polysilicone-2, Potassium Hydroxide, Phenoxyethanol, Sodium Benzoate, Potassium Sorbate. 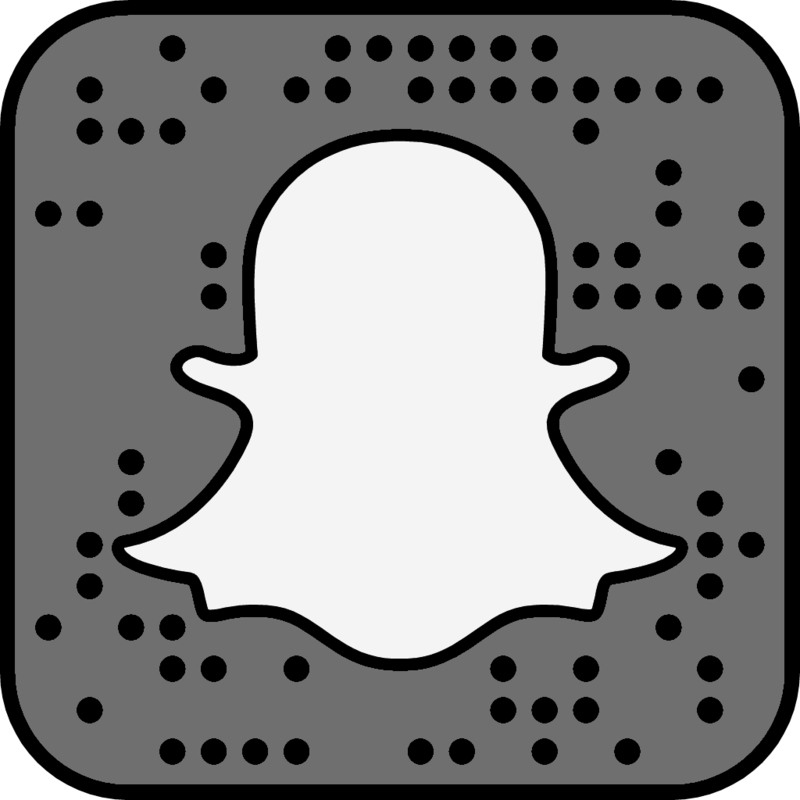 [+/- (May Contain/Peut Contenir): Mica, Titanium Dioxide (CI 77891), Iron Oxides (CI 77491), Iron Oxides (CI 77492), Iron Oxides (CI 77499)]. 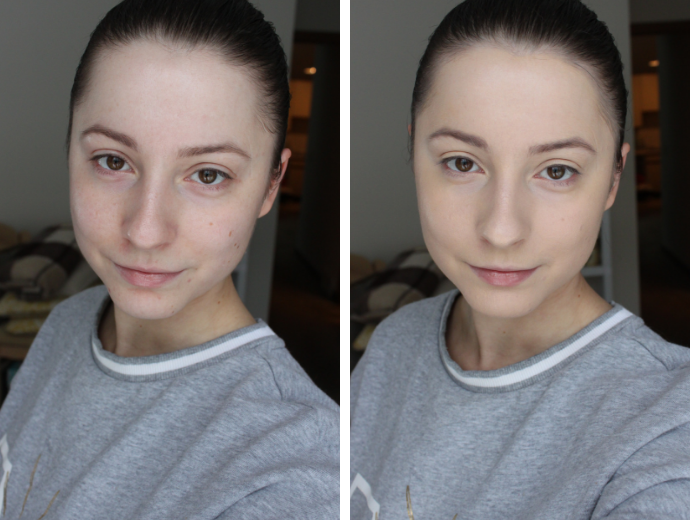 Full-face swatch: bare skin on the left, NARS Natural Radiant Longwear Foundation in Deauville on the right, no concealer. I actually don’t reach for NARS Natural Radiant Longwear Foundation all that often anymore, although at one point it used to be one of my favorite liquid foundation formulas. 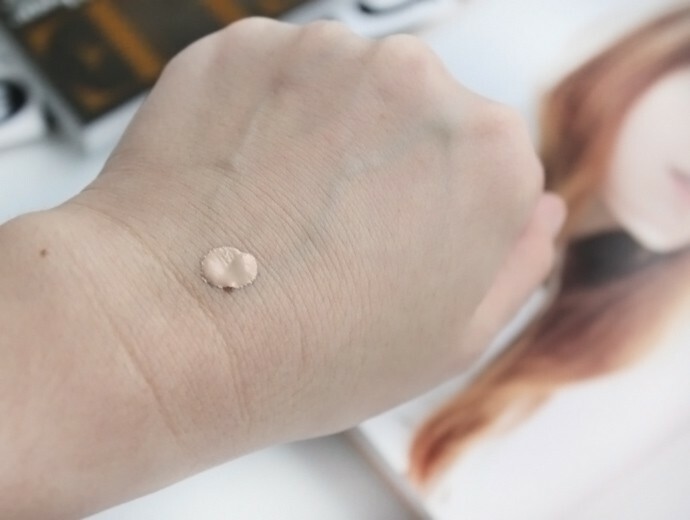 I am quite fond of the healthy luminous finish it gives my skin, so even though it’s a full coverage product, it kind of looks like second skin, but better. If I didn’t switch my preference to sheer products, I would still be using this one, no doubt. 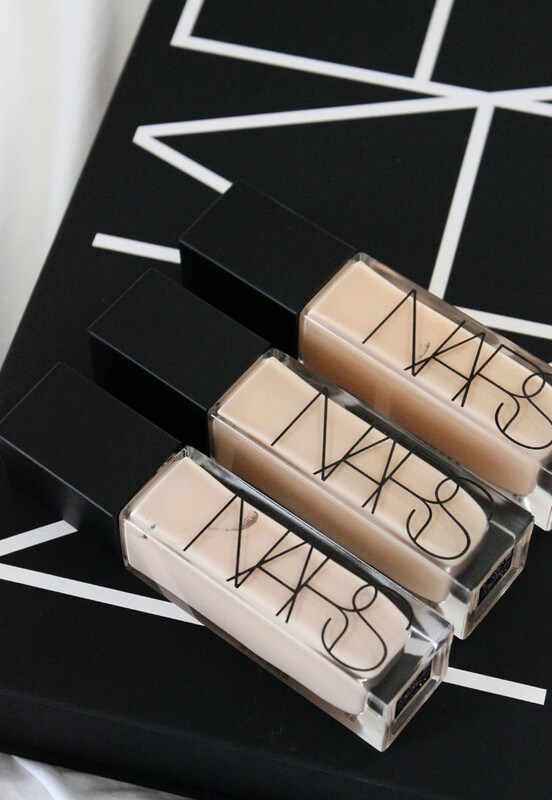 Have you tried NARS Natural Radiant Longwear Foundation? 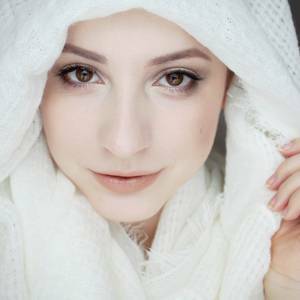 Do you wear full coverage formulas? Let me know in the comments below!